The AeroVelo / University of Toronto team members won the $250,000 Sikorsky prize for Human Powered helicopter flight. Maria Leijerstam became the first person to pedal to the South Pole. 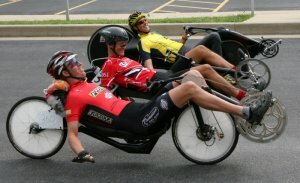 She rode a custom ICE recumbent trike. Maria Parker won the RAAM in the female recumbent category after making an incredible comeback. She was also fastest female overall. Sebastiaan Bowier of the Delft team set a new WHPSC Battle Mountain 200M world record of 83.13 mph. Team Cieo broke the Tandem One Hour record by riding 51.582 miles at the Dekra track. Sebastiaan Bowier set an unofficial unfaired stock one hour distance of 32.023 miles at RDW. Gareth Hanks set a 45.857 mile one hour world record in the single rider trike category. Graeme Obree's prone streamliner 200M record attempts for bringing media attention to the human powered speed championships. Keita Saito of Tokyo Tech's team Meister won the 2013 Japan International Birdman Rally with a flight distance of over 20 kilometers.